This project illustrates how to use the standard IO facilities (stdio) provided by this library. It assumes a basic knowledge of how the stdio subsystem is used in standard C applications, and concentrates on the differences in this library's implementation that mainly result from the differences of the microcontroller environment, compared to a hosted environment of a standard computer. This demo is meant to supplement the documentation, not to replace it. The demo is set up in a way so it can be run on the ATmega16 that ships with the STK500 development kit. The UART port needs to be connected to the RS-232 "spare" port by a jumper cable that connects PD0 to RxD and PD1 to TxD. The RS-232 channel is set up as standard input (stdin) and standard output (stdout), respectively. The LCD controller is used in 4-bit mode, including polling the "busy" flag so the R/~W line from the LCD controller needs to be connected. Note that the LCD controller has yet another supply pin that is used to adjust the LCD's contrast (V5). Typically, that pin connects to a potentiometer between Vcc and GND. Often, it might work to just connect that pin to GND, while leaving it unconnected usually yields an unreadable display. Port A has been chosen as 7 pins are needed to connect the LCD, yet all other ports are already partially in use: port B has the pins for in-system programming (ISP), port C has the ports for JTAG (can be used for debugging), and port D is used for the UART connection. stdiodemo.c This is the main example file. As usual, include files go first. While conventionally, system header files (those in angular brackets < ... >) go before application-specific header files (in double quotes), defines.h comes as the first header file here. The main reason is that this file defines the value of F_CPU which needs to be known before including <utils/delay.h>. The function ioinit() summarizes all hardware initialization tasks. As this function is declared to be module-internal only (static), the compiler will notice its simplicity, and with a reasonable optimization level in effect, it will inline that function. That needs to be kept in mind when debugging, because the inlining might cause the debugger to "jump around wildly" at a first glance when single-stepping. The definitions of uart_str and lcd_str set up two stdio streams. The initialization is done using the FDEV_SETUP_STREAM() initializer template macro, so a static object can be constructed that can be used for IO purposes. This initializer macro takes three arguments, two function macros to connect the corresponding output and input functions, respectively, the third one describes the intent of the stream (read, write, or both). Those functions that are not required by the specified intent (like the input function for lcd_str which is specified to only perform output operations) can be given as NULL. The stream uart_str corresponds to input and output operations performed over the RS-232 connection to a terminal (e.g. from/to a PC running a terminal program), while the lcd_str stream provides a method to display character data on the LCD text display. The function delay_1s() suspends program execution for approximately one second. This is done using the _delay_ms() function from <util/delay.h> which in turn needs the F_CPU macro in order to adjust the cycle counts. As the _delay_ms() function has a limited range of allowable argument values (depending on F_CPU), a value of 10 ms has been chosen as the base delay which would be safe for CPU frequencies of up to about 26 MHz. This function is then called 100 times to accomodate for the actual one-second delay. In a practical application, long delays like this one were better be handled by a hardware timer, so the main CPU would be free for other tasks while waiting, or could be put on sleep. At the beginning of main(), after initializing the peripheral devices, the default stdio streams stdin, stdout, and stderr are set up by using the existing static FILE stream objects. While this is not mandatory, the availability of stdin and stdout allows to use the shorthand functions (e.g. printf() instead of fprintf()), and stderr can mnemonically be referred to when sending out diagnostic messages. Just for demonstration purposes, stdin and stdout are connected to a stream that will perform UART IO, while stderr is arranged to output its data to the LCD text display. Finally, a main loop follows that accepts simple "commands" entered via the RS-232 connection, and performs a few simple actions based on the commands. First, a prompt is sent out using printf_P() (which takes a program space string). The string is read into an internal buffer as one line of input, using fgets(). While it would be also possible to use gets() (which implicitly reads from stdin), gets() has no control that the user's input does not overflow the input buffer provided so it should never be used at all. If fgets() fails to read anything, the main loop is left. Of course, normally the main loop of a microcontroller application is supposed to never finish, but again, for demonstrational purposes, this explains the error handling of stdio. fgets() will return NULL in case of an input error or end-of-file condition on input. Both these conditions are in the domain of the function that is used to establish the stream, uart_putchar() in this case. In short, this function returns EOF in case of a serial line "break" condition (extended start condition) has been recognized on the serial line. Common PC terminal programs allow to assert this condition as some kind of out-of-band signalling on an RS-232 connection. When leaving the main loop, a goodbye message is sent to standard error output (i.e. to the LCD), followed by three dots in one-second spacing, followed by a sequence that will clear the LCD. Finally, main() will be terminated, and the library will add an infinite loop, so only a CPU reset will be able to restart the application. The 'q' (quit) command has the same effect of leaving the main loop. The 'l' (LCD) command takes its second argument, and sends it to the LCD. The 'u' (UART) command takes its second argument, and sends it back to the UART connection. Command recognition is done using sscanf() where the first format in the format string just skips over the command itself (as the assignment suppression modifier * is given). This file just contains a few peripheral definitions. The F_CPU macro defines the CPU clock frequency, to be used in delay loops, as well as in the UART baud rate calculation. The macro UART_BAUD defines the RS-232 baud rate. Depending on the actual CPU frequency, only a limited range of baud rates can be supported. The remaining macros customize the IO port and pins used for the HD44780 LCD driver. Each definition consists of a letter naming the port this pin is attached to, and a respective bit number. For accessing the data lines, only the first data line gets its own macro (line D4 on the HD44780, lines D0 through D3 are not used in 4-bit mode), all other data lines are expected to be in ascending order next to D4. This file describes the public interface of the low-level LCD driver that interfaces to the HD44780 LCD controller. Public functions are available to initialize the controller into 4-bit mode, to wait for the controller's busy bit to be clear, and to read or write one byte from or to the controller. As there are two different forms of controller IO, one to send a command or receive the controller status (RS signal clear), and one to send or receive data to/from the controller's SRAM (RS asserted), macros are provided that build on the mentioned function primitives. Finally, macros are provided for all the controller commands to allow them to be used symbolically. The HD44780 datasheet explains these basic functions of the controller in more detail. This is the implementation of the low-level HD44780 LCD controller driver. On top, a few preprocessor glueing tricks are used to establish symbolic access to the hardware port pins the LCD controller is attached to, based on the application's definitions made in defines.h. The hd44780_pulse_e() function asserts a short pulse to the controller's E (enable) pin. Since reading back the data asserted by the LCD controller needs to be performed while E is active, this function reads and returns the input data if the parameter readback is true. When called with a compile-time constant parameter that is false, the compiler will completely eliminate the unused readback operation, as well as the return value as part of its optimizations. As the controller is used in 4-bit interface mode, all byte IO to/from the controller needs to be handled as two nibble IOs. The functions hd44780_outnibble() and hd44780_innibble() implement this. They do not belong to the public interface, so they are declared static. Building upon these, the public functions hd44780_outbyte() and hd44780_inbyte() transfer one byte to/from the controller. The function hd44780_wait_ready() waits for the controller to become ready, by continuously polling the controller's status (which is read by performing a byte read with the RS signal cleard), and examining the BUSY flag within the status byte. This function needs to be called before performing any controller IO. Finally, hd44780_init() initializes the LCD controller into 4-bit mode, based on the initialization sequence mandated by the datasheet. As the BUSY flag cannot be examined yet at this point, this is the only part of this code where timed delays are used. While the controller can perform a power-on reset when certain constraints on the power supply rise time are met, always calling the software initialization routine at startup ensures the controller will be in a known state. This function also puts the interface into 4-bit mode (which would not be done automatically after a power-on reset). This function declares the public interface of the higher-level (character IO) LCD driver. The implementation of the higher-level LCD driver. This driver builds on top of the HD44780 low-level LCD controller driver, and offers a character IO interface suitable for direct use by the standard IO facilities. Where the low-level HD44780 driver deals with setting up controller SRAM addresses, writing data to the controller's SRAM, and controlling display functions like clearing the display, or moving the cursor, this high-level driver allows to just write a character to the LCD, in the assumption this will somehow show up on the display. Control characters can be handled at this level, and used to perform specific actions on the LCD. Currently, there is only one control character that is being dealt with: a newline character (\n) is taken as an indication to clear the display and set the cursor into its initial position upon reception of the next character, so a "new line" of text can be displayed. Therefore, a received newline character is remembered until more characters have been sent by the application, and will only then cause the display to be cleared before continuing. This provides a convenient abstraction where full lines of text can be sent to the driver, and will remain visible at the LCD until the next line is to be displayed. Further control characters could be implemented, e. g. using a set of escape sequences. That way, it would be possible to implement self-scrolling display lines etc. 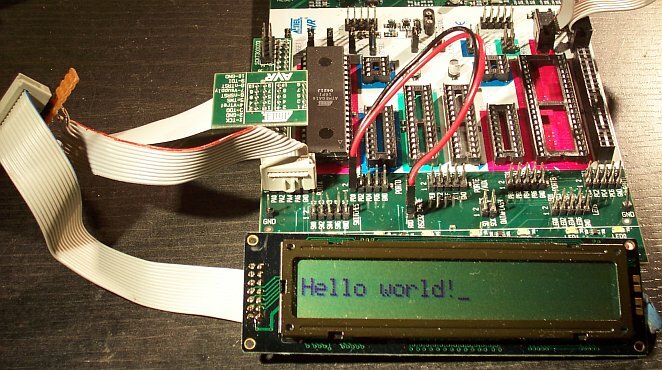 The public function lcd_init() first calls the initialization entry point of the lower-level HD44780 driver, and then sets up the LCD in a way we'd like to (display cleared, non-blinking cursor enabled, SRAM addresses are increasing so characters will be written left to right). The public function lcd_putchar() takes arguments that make it suitable for being passed as a put() function pointer to the stdio stream initialization functions and macros (fdevopen(), FDEV_SETUP_STREAM() etc.). Thus, it takes two arguments, the character to display itself, and a reference to the underlying stream object, and it is expected to return 0 upon success. This function remembers the last unprocessed newline character seen in the function-local static variable nl_seen. If a newline character is encountered, it will simply set this variable to a true value, and return to the caller. As soon as the first non-newline character is to be displayed with nl_seen still true, the LCD controller is told to clear the display, put the cursor home, and restart at SRAM address 0. All other characters are sent to the display. The single static function-internal variable nl_seen works for this purpose. If multiple LCDs should be controlled using the same set of driver functions, that would not work anymore, as a way is needed to distinguish between the various displays. This is where the second parameter can be used, the reference to the stream itself: instead of keeping the state inside a private variable of the function, it can be kept inside a private object that is attached to the stream itself. A reference to that private object can be attached to the stream (e.g. inside the function lcd_init() that then also needs to be passed a reference to the stream) using fdev_set_udata(), and can be accessed inside lcd_putchar() using fdev_get_udata(). Public interface definition for the RS-232 UART driver, much like in lcd.h except there is now also a character input function available. As the RS-232 input is line-buffered in this example, the macro RX_BUFSIZE determines the size of that buffer. This implements an stdio-compatible RS-232 driver using an AVR's standard UART (or USART in asynchronous operation mode). Both, character output as well as character input operations are implemented. Character output takes care of converting the internal newline \n into its external representation carriage return/line feed (\r\n). The function uart_init() takes care of all hardware initialization that is required to put the UART into a mode with 8 data bits, no parity, one stop bit (commonly referred to as 8N1) at the baud rate configured in defines.h. At low CPU clock frequencies, the U2X bit in the UART is set, reducing the oversampling from 16x to 8x, which allows for a 9600 Bd rate to be achieved with tolerable error using the default 1 MHz RC oscillator. The public function uart_putchar() again has suitable arguments for direct use by the stdio stream interface. It performs the \n into \r\n translation by recursively calling itself when it sees a \n character. Just for demonstration purposes, the \a (audible bell, ASCII BEL) character is implemented by sending a string to stderr, so it will be displayed on the LCD. The public function uart_getchar() implements the line editor. If there are characters available in the line buffer (variable rxp is not NULL), the next character will be returned from the buffer without any UART interaction. If there are no characters inside the line buffer, the input loop will be entered. Characters will be read from the UART, and processed accordingly. If the UART signalled a framing error (FE bit set), typically caused by the terminal sending a line break condition (start condition held much longer than one character period), the function will return an end-of-file condition using _FDEV_EOF. If there was a data overrun condition on input (DOR bit set), an error condition will be returned as _FDEV_ERR.